The bookshelves have been improved! As I mentioned in my beginning of the year post, the bookshelves needed an update. When I first inherited my classroom, my predecessor used a lot of pink and yellow. I didn't think a room like that would feel very welcoming to 10 year old boys, so I changed that within the year. But I didn't banish ALL pink from my room. 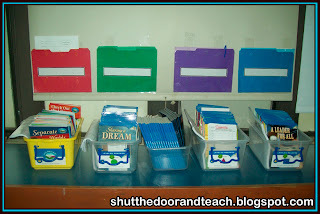 I also had some double sided pink and purple index cards, which I used to make labels for my book bins. Well, they were looking a little frayed and ratty. Most of them were laminated, but since I always change which books to feature and which ones I lump into the generic "realistic fiction" or "science" bin, sometimes I don't make it to the laminator every time. Well, this year I decided it was time for an upgrade. 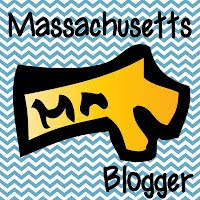 Not only was it time to change the colors to fit the color scheme I have going on (teal, aqua, lime green, with brown and white for neutrals) but I needed to change out my font. I had tried to get creative with my fonts, but the result was not only a mis-mash of styles, they were also not as clear as a nice bold sans serif font is. So I used the same font I use on the product thumbnail of my TPT store because I figured if it's been clear and eye-catching on a 1 inch picture for web surfers, it should be clear enough enlarged on an index card. 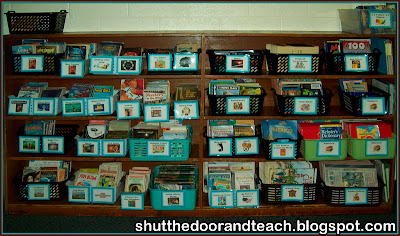 Now, those of you who also follow my TPT store may be thinking, "Those are not the same book bin labels that you sell." And it's true. I personally like to have graphics on my labels even at the 4th grade level. We all can't help to think of Nike when we see the swoosh; visual marketing is powerful. But I can't sell those labels commercially for one simple reason: Copyright infringement. I know not everyone follows that rule, but there you go. I also know that some upper elementary teachers think that having the graphics is too busy or too babyish. 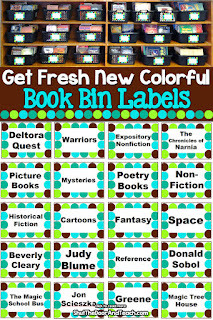 So I use the style that works for me, personally, and the labels I sell are legal, contain all the same popular 4th grade titles that many teachers are looking for, have a nice bold, clear font, they're color coded for fiction as well as nonfiction, and they have an attractive, free for commercial use border. 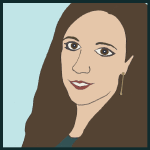 Although there is space for a graphic if you wish to add one, those teachers who have bought and used them as is were saved a lot of work for less than $2. But back to the organization. 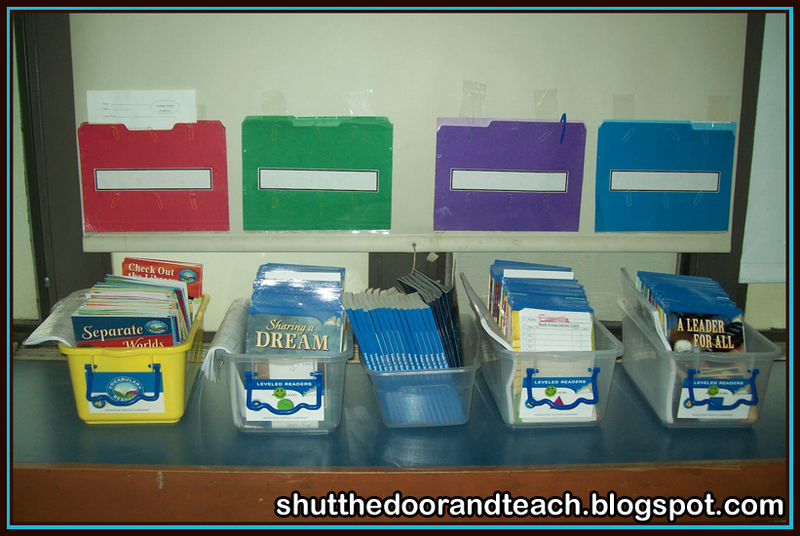 My next fix was the Guided Reading Group materials that were previously located on opposite ends of my classroom. 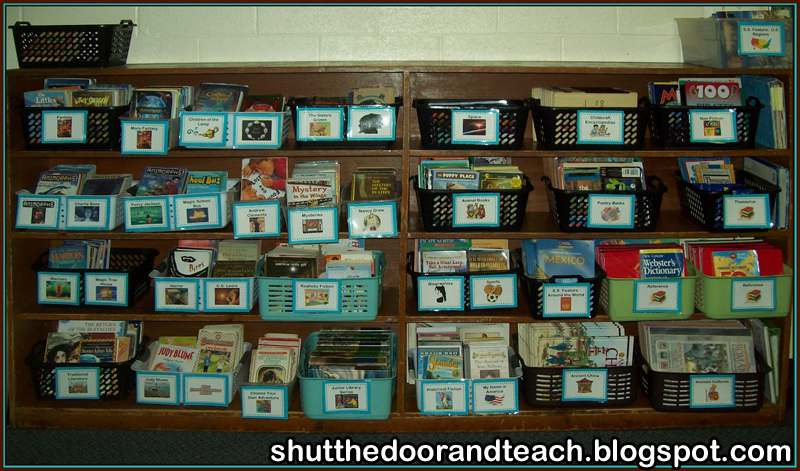 See, the leveled books are on the windowsill shelf at the rug area, where I meet with my groups. There are sign out cards in the book bins with the kid's names and book titles. But then on the other side of the room were the postings of students' names, book titles for the week, and differentiated worksheets. It was a pain all year. It was never a smooth transition for the inclusion teacher. I had to get everything in one spot. 1. It might be to confusing for kids to know which books they should and should not take out when reading for pleasure/choice. 2. I use the top shelf as well as the wall space for other things throughout the year. So the best solution I could see was to move the postings from the bulletin board to the (non-functioning) window shade. Not bad. We'll see how it works out once we start groups later in the month!